If a respondent chooses to opt out of the survey they will be unable to participate in that survey and will not receive any further emails relating to it. 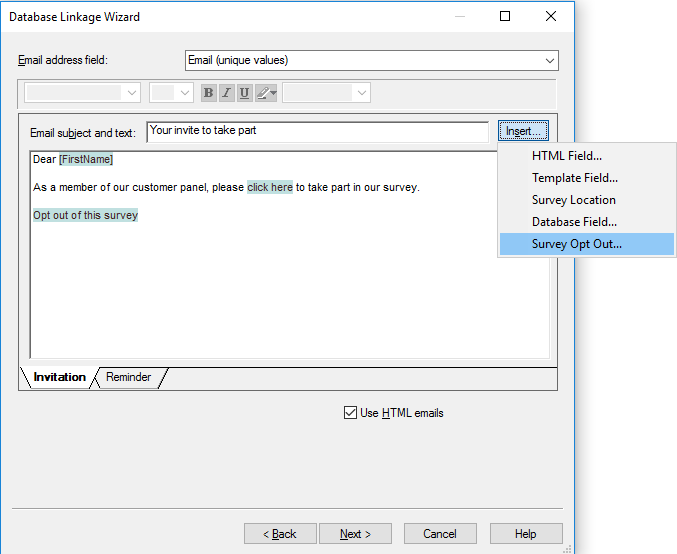 If you are creating Snap WebHost email invitations and reminders using the Database Link wizard, you will need to construct an email message in the dialogue below. As well as inserting the Survey Location in the message, you should also insert an Opt Out link enabling respondents to opt out of the survey. 1. Set the email address field at the top of the window to the database field that uniquely identifies your respondent. This will be used to provide the email address for the respondents in Snap WebHost. 2. Type the subject heading in the Email subject and text field. 3. Construct your email message in the large box. 4. Use the [Insert…] button to insert the Survey Location. This will be made into a link to the survey when the message is uploaded to Snap WebHost. You can change or add email messages after the survey has been uploaded to Snap WebHost. 5. Use the [Insert…] button to insert the Opt Out link from the survey. If a respondent clicks this link Snap WebHost will not send them any more emails. 6. You will see the default Opt Out wording appear in the window. You may edit this wording to provide further information if you wish. 7. Click [Next]. You will see a summary of what the database link does. 8. Enter a name for the database link and click [Finish] and then [Close]. You will need to select this link when you publish. It is also possible to insert the Opt Out link into an email using the email editor in Snap WebHost. This can be found in the Messages tab, when choosing to edit a message. If you wish to use a custom page for respondents to go to when they opt out of a survey, you will need to create your own optout.html page which is described here. Note: If a respondent does choose to opt out of your survey, it is a good idea to keep a record of this yourself by downloading their status and updating your own database. This can be done from the Respondents tab in Snap WebHost.